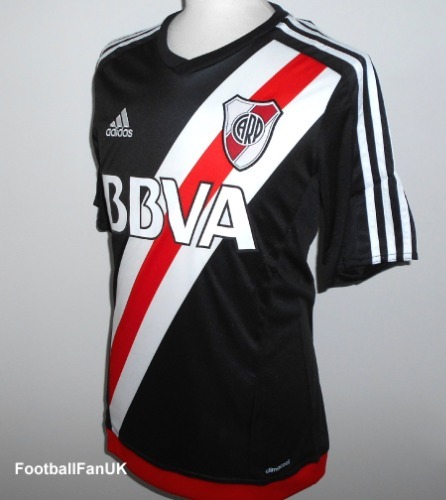 This is an official Adidas short sleeve shirt of argentinian side Club Atletico River Plate. This special edition 4th shirt was introduced during the 2016-2017 season in honour of club legendary striker Angel Labruna who scored 317 goals for the club during his career. He was known for wearing a black tie with the red and white River Plate diagonal stripes across it, and this is replicated in this classy black jersey. New with tags in Adidas packaging. - Woven club badge and Adidas logo. - Black with red and white sash and red hem. - Adidas product code AO3471. - Adult men's Small size.